The Heritage Statement below is a concise summary. A much more comprehensive Statement of Historical Significance has been submitted recently as part of the planning application. If you are interested in a more in depth history of the site with illustrations and historical plans, it is well worth a read. It can be downloaded by clicking on the link immediately below. 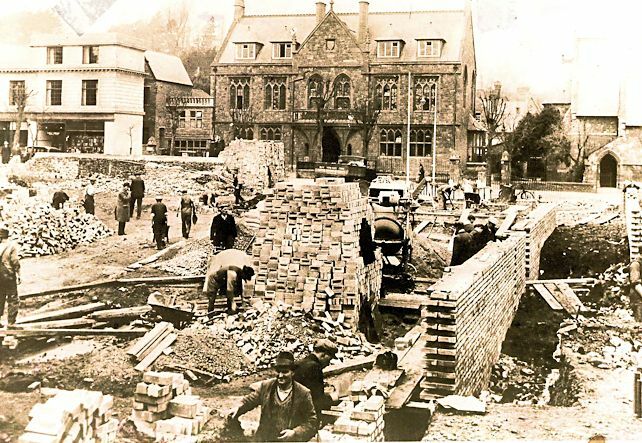 This project concerns the restoration and rehabilitation of a group of Heritage buildings in the heart of Minehead known as The Old Hospital in order to accommodate a much needed community hub. Because of the inherent quality and beauty of some parts of the site, the site as a whole is Grade 2 listed. The jewel of these buildings represents the very best of Victorian architecture. It was designed by James Piers St Aubyn, who had been appointed by the Lutterell Estates in the 1860’s to implement a number of their projects in and around Minehead. This building is a beautiful and important “neo Gothic” style structure built in 1888-89 by Thomas Ponsford at a cost of £3257, to be both a Public Hall and the town Assembly Room. At the time it was arguably the most attractive and useable Public Assembly Rooms in the area. The first public meeting to be held there was by the Church Missionary Society on Monday 3rd June 1889. The building was configured on two floors. At ground level a central front entrance gave access to an internal vestibule area, on either side of which there was a large room measuring 27ft by 27ft. Passing through the vestibule towards the rear of the building there was a wide double stair-case, flanked on either side by two more rooms measuring 23ft by 18ft. The double staircase wound its way up to first floor level, ending at a broad central landing area. At first floor level the landing lead forward through a pair of tall gothic doorways into a very grand assembly room with vaulted ceilings which ran the entire width of the building. Room dimensions were 70ft by 35ft. In addition the first floor landing gave access to two more general rooms on either side of the stair core, these were 20ft by 20ft. 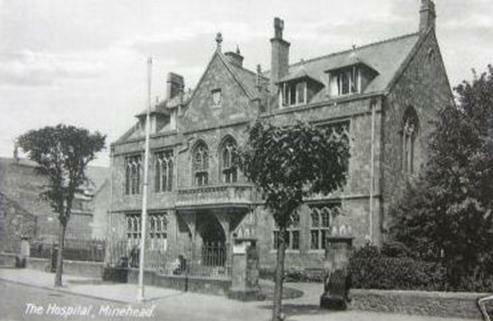 At some point in time, probably even before construction commenced, ownership of the site was transferred to The Minehead Public Hall Company Ltd who ran the hall as a business. In 1910 however the company became bankrupt and ownership passed on to The Wilts and Dorset Bank (now part of Lloyds Bank) for £3,100. W&D Bank promptly converted it into a branch bank with managers residence. In 1915/16 the building ownership changed again, then becoming a cottage style hospital. In the 1920’s major works were designed by local architect William John Tamlyn and carried out to the rear first floor and roof areas above the stair core and the rear rooms to either side, These works made extensive alterations to the whole of the roof area (including the main roof for a second time) to accommodate operating theatre and support areas/wards etc. as well as a bed lift. At lower levels the room layouts were further changed to accommodate the lift and more wards etc. Subsequently the basic use and layout of the building has remained largely unaltered. The third and last Heritage building is in the middle of the site, designed again by William John Tamlyn constructed in 1923 to accommodate nursing staff in a form of dormitory over four levels with a single staircore. It was linked to the main building at ground and first floor levels only.These works also included a separate mortuary building, though this has long disappeared Both of these latter buildings are attractive in their own way but not quite so much as the main building. In the mid 1900’s the Health Service began constructing a number of single storey buildings and link corridors, effectively infilling between the buildings, as the need for hospital services grew. These buildings are of low grade but fulfilled their purpose. For many years the buildings have not been adequately maintained. Since falling into disuse the deterioration has accelerated. The aim of this heritage project is to safeguard and rehabilitate the site, removing low grade redundant “non heritage” structures and restoring the Heritage structures to their original beauty as far as can be, bringing them back into daily use. Examples of appropriate community functions, activities and services which may be available at the site include : adult learning and skills, advice centre, tourism advice, Library, wellbeing, keep fit, community events, weddings, performing arts, exhibitions, museum, information centre, counselling, council presence, interest group events, social interaction, Police high street presence, interface and interaction with Blenheim Gardens, corporate teambuilding and training, public conveniences facilities etc.. The upper levels of the rear buildings (ie levels 1,2&3 of the nurses accommodation together with level 1 of the police house) will be adapted sympathetically and with no changes to the external appearance into four residential flats for the rental market. By incorporating this residential element this will ensure a reasonable level of night time occupancy, so improving general site security. Community consultation, carried out by the Minehead Development Trust on a number of occasions in recent years, have identified that there is a very strong desire to create a community hub which should be both flexible and sustainable. There is also a strong desire to create a clear pedestrian access way through part of the site in order to link the Avenue at the front of the site with Blenheim Gardens at the rear. In their current form, much of the low grade modern structures can be readily used “as is”, at least for the foreseeable future. Some of the more unsightly modern structures however need to be demolished in order to open up the pedestrian access way and enable access into where the central reception and meet/greet area will need to be located. Part of this exercise will address the unsightly nature of remaining elements of the low grade structures by concealing them behind reflective glass cladding/curtain walling. Community use in the main building will involve a variety of activities and functions, ranging from small regular user groups to high profile public meetings, performing arts and private functions (such as weddings/receptions or performing arts or perhaps, for example, corporate training events). In its original 1888 form the building was readily able to meet this diverse range of demands by virtue of its large public room at first floor level, the generously proportioned double staircase (enabling rapid crowd movement) and the cluster of surrounding smaller rooms on two levels. Regrettably the alterations which have been carried out at various times since the original construction have resulted in a building which cannot perform at all as the type of community hub planned. In addition some of the alterations have introduced problems which give rise to significant structural concerns and have introduced a number of maintenance problems. For these reasons combined the proposal is to reinstate as much as possible of the original form of the main building by removing many of the alteration works and recreating missing or poorly altered walls and roof structure in the image of the original building to reinstate key features such as the double height vaulted assembly room, double staircase and cluster of smaller rooms). The creation of affordable residential accommodation within the upper levels of the old nurse’s home and the police station will be carried out with the absolute minimum possible alterations to internal building fabric and no changes externally. In the case of the Police House the alterations are concerned with configuring useable space for both a bathroom and a kitchen as well as establishing a secure fire escape. In the case of the nurses home the very minimal alterations (closure of two doorways, creation of two new ones and repositioning of fire doors) are necessary in order to establish a safe accessible fire escape route – which will also serve the top floor of the community hub in the main building.